I hope to be back to posting regularly next week, we've had a doozy of a week with strep revisiting our house, me and the little Miss have been under the weather. I don't believe I've ever been sick in the summer, it really stinks. Both doctors we visited said there is a big outbreak and they've never seen so many cases lately, weird huh? We are on the mends and I hope that you all will have a great and relaxing weekend! I've had strep throat twice in my life, so you have my sympathies. Feel better soon! Oh my word - I just had it this past week too and it was the first time since I got my tonsils out when I was nine years old. Crazy that your doc said there is an outbreak...and yeah pretty much the threshold of hell isn't it. Glad your on the mend I am hoping for a much healthier weekend too! Are you at least eating ice cream for dinner?! What a gorgeous room. 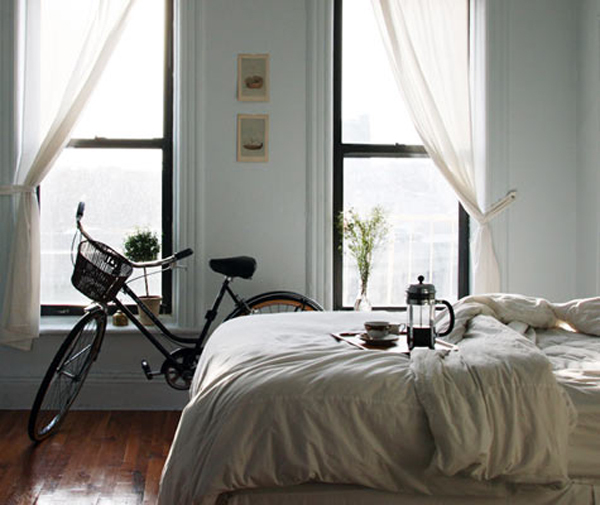 A cozy bed and fresh coffee -- yes please! I hope you're feeling better soon. there is an outbreak at my work too! weird, I have never been sick during the summer but its so much worse because you can't enjoy the nice weather. get better soon! Step is is horrible and so is being sick in the summer.